A new question history page for students added to ClassQuestion! 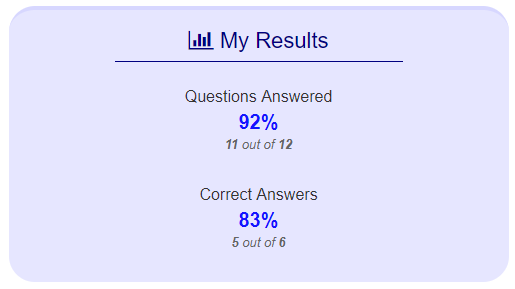 This page allows students to review previous questions and answers, as well as see what the correct answer was for the question (if there was a correct answer) and what their response was. When studying for an exam students often ask where they should be focusing their attention. Being able to review what they know and where they went wrong gives them a natural starting point! Don’t want student see previous questions? Don’t worry because this feature is completely optional. You can enable/disable it by going to Menu -> Class/Account Settings and clicking on your class. Use the toggle for: “Allow score and question viewing” to turn this feature off and on. Keep in mind that disabling this toggle will also prevent students seeing their participation and correct answer score (for more information on score viewing, see: https://blog.classquestion.com/2017/12/11/score-feedback/). New features have recently been added to ClassQuestion.com so I thought I’d take some time to talk about them over the coming weeks! As a teacher I’ve seen first hand how much students appreciate getting their scores back for assignments as quickly as humanly possible! With clicker questions this was always difficult because scores had to be manually uploaded to a course gradebook website. This is why real-time score feedback has been added to ClassQuestion! Now when a questions ends, participation and correct answer points will be calculated and automatically displayed on their screen. This feature is opt-in, meaning that you have a choice for whether you want students to see their scores or not (maybe because you are using a complex scoring system and want to avoid confusion).